90.10.01 - NEUSPEED Aluminum Oil Pan - Pann Auto Performance - San Diego largest aftermarket automotive performance parts - What do you drive? 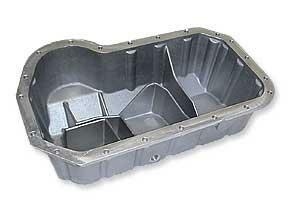 The NEUSPEED Aluminum Oil Pan is cast in the highest quality material and machined for a perfect fit. It’s fully baffled in a strong, light-weight design and finned for maximum cooling. Mounting holes are properly machined and clearanced for easy access to the 6mm hex head bolts. Gasket and bolts included. Fits all VW 4 cylinder engines for the A-1, A-2 and A-3 chassis.